Last month I wrote a follow up, Follow up on Green Technology that pays for itself, in which I said that the additional insulation I put in the ceiling resulted in a 10.2% drop in kilowatt hours and a $29.78 drop in the total bill. Another month has passed and I was hopeful that the January bill would show an even larger drop. The January bill has arrived and I am disappointed. The bill came in much lower, $63.92, but most of the lower cost can attributed to a warmer January. The amount of money I can attribute to the insulation is only $7. I have a couple ideas on how we used more electricity. Oh well! 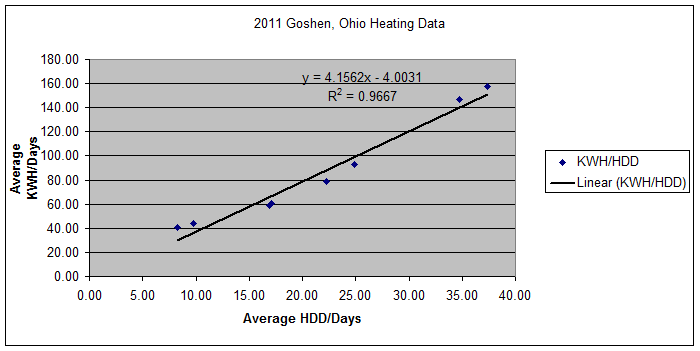 For kicks I decided to run the 2011 data(minus the air conditioner months of June through September) through a linear regression. A polynomial equation fits the data better, but the linear equation gives me a nice multiplier to work with. Here is my graph.